Collecting the umbilical blood - what's involved? The collection of umbilical cord blood cells is a painless, noninvasive, simple procedure that is performed after a uncomplicated delivery. The only test that needs to be done is an analysis of the mother for infectious disease. To do this, an ordinary blood sample is collected from the mother either 30 days before delivery or 48 hours after delivery. A "collection kit" is provided that contains all the necessary equipment for obtaining the cord blood stem cells in a sterile manner, and for maximizing the volume of cord blood collected. The containers are specially prepared with anticoagulants to prevent the cord blood from clotting. The collection of cord blood must begin within 15 minutes of delivery (see Figure 1). 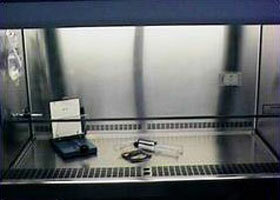 Then, the sample is sent to the laboratory in a shipping container that has been calibrated to maintain a room temperature environment for the sample. 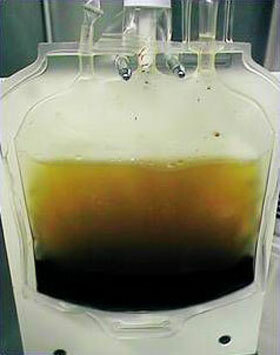 The cord blood is processed to reduce the volume of unwanted red blood cells and to maximize the content of stem cells in each container (see Figures 2 and 3). 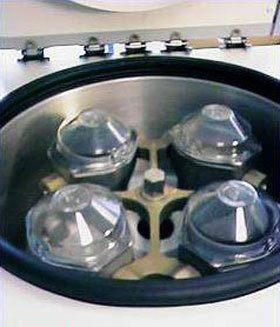 Assessment of the sample is also performed to ensure that the stem cells have remained viable (see Figures 4 and 5). Then, to maintain long-term viability of the cells, cryopreservation (maintenance of the cells at ultra-low temperatures) must be carried out within 48 hours of delivery of the cells to the storage facility. This means that arrangements for collection of the cord blood sample must be made prior to delivery. The containers used for long-term storage of umbilical cord blood stem cells must be able to withstand extremely cold temperatures, in the range of -196°C. 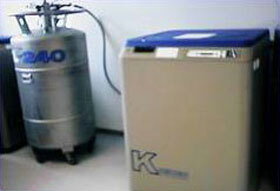 There is presently no evidence that stem cells stored at -196°C lose their biological activity. At present there is no regulatory requirement or conclusive scientific data for assigning an expiration date to cryopreserved cord blood stem cells. 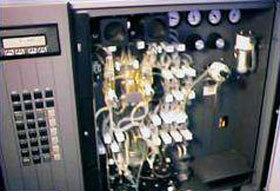 Depending on the storage facility, present expiration dates vary from 5 years to 18 years. What happens when the stored cells are suddenly needed? 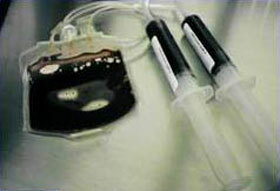 If a cord blood sample is required for transplant, a special transport container called a "dry shipper" is used to ship the frozen sample to the transplant center. 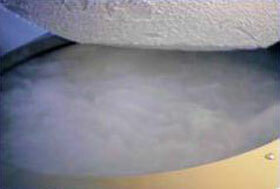 The dry shipper is filled with liquid nitrogen to maintain the cord blood stem cells at less than -150°C during transport. Thawing of the sample must be performed under strict guidelines to ensure the highest viability of stem cells recovered after the thaw (see Figures 6 and 7).